For Junior Bender, thief and “fixer” for crooks and other unsavory types, the days leading up to Christmas aren’t exactly filled with tidings of comfort and joy. He’s reminded more than usual of his conflicted relationship with his girlfriend and daughter. And, more urgently, he’s been “recruited” by a Russian thug and mall owner to find out who’s behind the shoplifting epidemic at the mall - with failure not an option. Just as he begins investigating, a murder in the mall adds a puzzling new facet to an already convoluted case. Junior needs to figure out the shoplifting scheme, solve the murder, and get in the holiday mood by Christmas Eve. Hallinan’s cast of less-than-upright and highly entertaining characters make for a delightful and off-beat holiday read. It’s three days until Christmas and Junior Bender, Hollywood’s fasttalking fixer for the felonious, is up to his ears in shopping mall Santas, Russian mobsters, desperate holiday shoppers, and (’tis the season) murder. The halls are decked, the deck is stacked, and here comes that jolly old elf. Junior Bender, divorced father of one and burglar extraordinaire, finds himself stuck inside the Edgerton Mall, and not just as a last-minute shopper (though he is that too). Edgerton isn’t exactly the epicenter of holiday cheer, despite its two Santas, canned Christmas music, chintzy bows, and festive lights. The mall is a fossil of an industry in decline; many of its stores are closed, and to make matters worse, there is a rampant shoplifting problem. The murderous Russian mobster who owns the place has decided it takes a thief to catch a thief and hires Junior—under threat—to solve the shoplifting problem for him. But Junior’s surveillance operation doesn’t go well: as Christmas Eve approaches, two people are dead and it’s obvious that shoplifting is the least of the mall’s problems. To prevent further deaths, possibly including his own, Junior must confront his dread of Christmas—both present and past. Timothy Hallinan has been nominated for the Edgar, Nero, Shamus, Macavity, and Silver Dagger awards. He is the author of twenty widely praised books, including the Poke Rafferty Bangkok thrillers, most recently Fools’ River, and the Junior Bender Hollywood burglar mysteries, including Herbie’s Game, winner of the Lefty Award for Best Humorous Mystery. After years of working in the television and music industries, he now writes full-time. He lives in California and Thailand. "Burglar Junior Bender may just be our favorite literary P.I." "West Coast fun for the noir at heart." —Sunday Times, "Best Christmas Mysteries of 2016"
"Slick sleuthing, a touching romance and several good laughs." "Comparisons to Raymond Chandler and Donald Westlake are totally deserved and should give you a clue as to whether you’ll like this book as much as I did." "Wickedly funny . . . Somewhere amid all this suspense and uncertainty lies the true meaning of Christmas, assuming that Junior can stay alive long enough to see it." "Hallinan deserves to win an Edgar for his ingeniously plotted, often hilarious sixth Junior Bender novel." "Nobody does comic mystery with an edge better than Hallinan." "I had never read [Hallinan], and don't know why I decided to read this Junior Bender—in May. Out of season. But I am so glad I did—Junior is quite the find." "Once again, Timothy Hallinan has given us a book to cheer, and a character to cheer for, but this outing is like a sweet little holiday story… with dead bodies, live crooks, and a wartime reminiscence that’s both heartwarming and terrifying." "It’s hard to top Hallinan’s Junior Bender, the Los Angeles 'Thief of Thieves'." "My new favorite Christmas crime novel." "A must-read for all seasons." 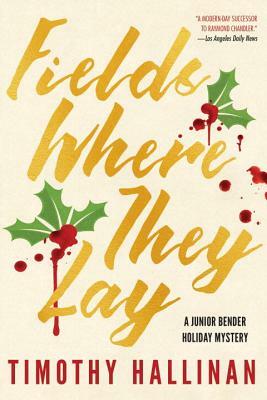 "Even if you hate the holidays with reasons just as good as Junior's—or especially if you do—this book is still the best gift you can give to yourself." "What a Christmas story would look like if Raymond Chandler wrote it." "Hallinan has skillfully managed to write a story that manages both the cynical and hopeful sides of Christmas. It’s a good mix that Hallinan mines for its humorous promise—fighting off a gunman with the help of tinsel, anyone?—yet recognizes the humanity that is at the center of the holiday, even for someone as immune to warm fuzzies as a professional thief." "Do your friends a favor this Christmas—turn them on to Junior Bender." "A smart, cynical mystery . . . The best burglar in Los Angeles."